The UI’s Center for Global and Regional Environmental Research – along with other universities and other institutions across the state – sponsors the annual Iowa Climate Science Educators Forum. The event provides professors, researchers, students, and others the opportunity to discuss the most up-to-date climate-related research as well as methods for engaging students when teaching about climate change. Dave Courard-Hauri, associate professor of environmental science and policy at Drake University, welcomes guests to the forum. Kris Kilibarda, state science consultant for Iowa Department of Education, and Ted Neal, clinical instructor of science education at the University of Iowa, provide an understanding of the Next Generation Science Standards. Kilibarda describes the ways in which Next Generation Science Standards aim to teach across curriculum. Neal explains a graph that illustrates the various subject expertise new teachers bring to Iowa’s schools. Professor of chemistry at the University of Iowa, Betsy Stone, presents about a successful climate education tool she has help to implement in Iowa schools. Barbara Ehlers, associate professor of education at Upper Iowa University, shares information about Environmental Issues Instruction. The organization provides workshops for teachers looking to better teach environmental science. Director of the USDA Midwest Climate Hub Dennis Todey discusses the issues climate change poses for the agricultural industry. Diane Debinski, professor of ecology, evolution, and organismal biology at Iowa State University, presents on climate change adaptation of grassland ecosystems as reflected by her research. Director of the Iowa Water Center Rick Cruse outlines the impact of increasingly intense rainfall on soil erosion in Iowa. The University of Iowa Center for Global and Regional Environmental Research hosted the 2016 Iowa Climate Science Educators Forum in West Des Moines this Friday. 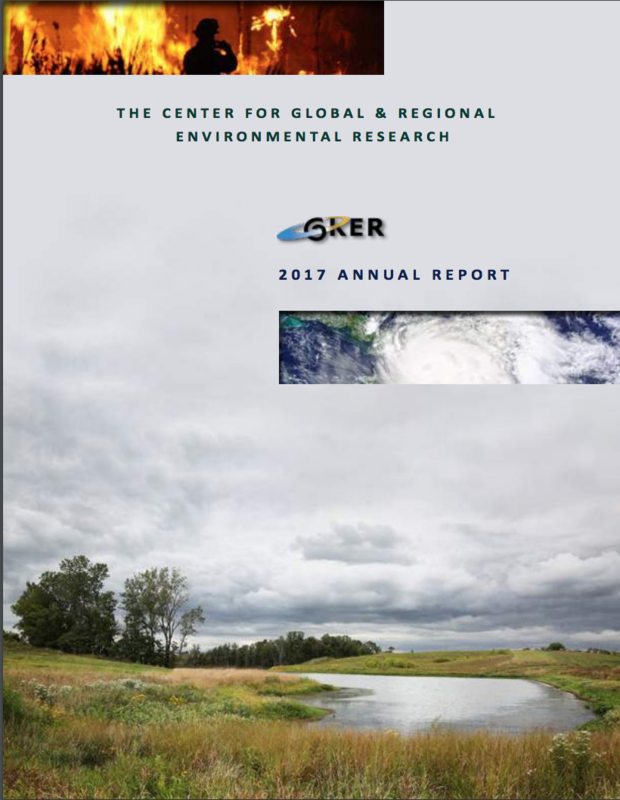 The event featured presentations from leaders in higher education, scientists, and experts in related fields that aimed to improve climate science education for students in Iowa. Kris A. Kilibarda, State Science Consultant for the Iowa Department of Education, outlined the goals and implementation plan for Next Generation Science Standards (NGSS). NGSS are K-12 science standards that will be adopted by schools in Iowa over the next three years. The standards promote cross-curriculum, investigative learning that includes elements of climate science. Event organizer David Courard-Hauri also took the time to reflect on the recent release of the sixth annual Iowa climate statement titled Iowa Climate Statement 2016: The Multiple Benefits of Climate-Smart Agriculture. Central College is one of only 13 colleges in the country to require all of its students to take a sustainability course before graduating. The campus boasts an organic garden that provides experiential learning and food for students. The Pella college also leads a Sustainability Faculty Workshop for higher education instructors of all disciplines to design courses which integrate sustainability into their coursework. “This interdisciplinary approach is something that’s really central to what we do,”Bruskewitz added. Over the lunch hour, Senior Science Writer for IIHR at the University of Iowa, Connie Mutel, offered suggestions for climate scientists looking to more effectively communicate their work to the general public. Mutel, who is also the author of A Sugar Creek Chronicle: Observing Climate Change from a Midwestern Woodland, emphasized the importance of storytelling and a solution-based tone when communicating about climate change. More than thirty scientists, students, and educators attended the third annual Iowa Climate Science Educators Forum at Des Moines University on Friday. Iowa State University agronomy professor Brian Hornbuckle was the first to present, discussing ways to teach about the effects of greenhouse gas. “The greenhouse effect is such an essential part of climate change [and] we need to make sure we teach about it correctly,” said Hornbuckle. Hornbuckle teaches Introduction to Weather and Climate at Iowa State, a roughly 300-student lecture consisting mostly of freshmen. He said his focus is to dispel incorrect notions that his students may have about the greenhouse effect. One of Horkbuckle’s teaching techniques is through the use of song. He changed the lyrics of Journey’s “Wheel in the Sky” to “The radiators in the sky keep on burning” as a catchy way to get through to his students. David Courard-Hauri, an associate professor of environmental science and policy, discussed his Science and Policy of Climate course at Drake University. The course focuses on the intersection of science, social, and political issues in regard to climate. “The question is how do we teach scale and feasibility?” asked Courard-Hauri. One component of the course is a role-playing exercise in which students take on the role of a different country or interest group and how they would approach climate-related policy. Students use quantitative data to come up with policy suggestions which helps them to identify the scale of certain measures as well as the potential costs and costs savings of such measures. Grinnell College political science professor Wayne Moyer discussed his Applied Policy Analysis Climate Change course, which is composed of about 20 undergraduates. Students are required to read two books: Why We Disagree About Climate Change by Mike Hulme and Global Warming Gridlock by David G. Victor. The courses focuses on the intersection of science, economics, and politics. Moyer emphasized that scientific research is crucial for policy change. “When you don’t know things exactly that creates policy problems,” he said. The course also focuses on obstacles for implementing policies to address climate change, such as reasons for why people disagree about the issue usually involving their values, beliefs, and fears. One assignment requires students to persuade a skeptic that climate change is real. Moyer said that one of his students, who now serves on a republican congressional staff in Washington D.C., was the lone skeptic in his class and that this student brought an interesting perspective to the course. “He listened to people on the other side and contributed lot. It was a real asset,” said Moyer. The morning part of the forum was rounded out with a series of shorter presentations. University of Iowa chemical engineering professor Charlie Stainer discussed his upper-level undergrad course, Green Chemical and Energy Technologies. University of Dubuque environmental chemistry professor Adam Hoffman discussed carbon dioxide and ocean acidification and effective techniques for teaching these concepts to students. The morning session concluded with a presentation from DMACC representatives who discussed ways in which their campuses have taken measures to reduce their carbon footprint. Representatives from eight different Iowa colleges and universities attended the event including University of Iowa, Iowa State University, University of Northern Iowa, Drake University, University of Dubuque, Grinnell College, Des Moines Area Community College, and Southwest Community College. The 2014 Iowa Climate Science Educators Forum took place on the University of Iowa Oakdale Campus in Coralville on Friday, October 31. The 2nd annual event was attended by approximately 50 climate and health experts from across the state. Chris Anderson – Assistant Director Climate Science Program at Iowa State University – was the first to present at Friday’s event as he discussed the impact of climate change in Iowa. “Climate change in Iowa is different from climate change on TV,” he said. One example of this is the frequency of spring and summer rainfall combinations. There were approximately seven instances of spring and summer rainfall combinations between 1893 and 1980 compared to five instances between 2008 and 2014. Mary Spokec – research geologist and program coordinator for IOWATER – along with David Osterberg – Associate Clinical Professor of Environmental Policy in the University of Iowa’s Department of Occupational and Environmental Health – took the stage next to discuss water quality issues related to climate change. They said part of the reason for toxic algal blooms which can lead to water contamination is because there are no national standards for algal cyanotoxins. This issue can be particularly problematic in Iowa other agricultural states where nitrogen and phosphorus can runoff of fields and into waterways which exacerbates the growth of hazardous algal blooms such as blue green algae. Extreme weather associated with climate change has also affected these algal growths. According to weekly monitoring of 38 state-owned beaches, there were 46 water quality advisories during 2013 and 2014 compared to seven in 2011 and two in 2010. Peter Thorne – head of the UI’s Department of Occupational and Environmental Health – presented next about climate-induced air quality issues affecting Iowans. Molds such as Aspergillus and Penicillium can grow on damp wood in houses and other structures that sustain flood damage. This can lead to a range of pulmonary conditions including mold allergies, asthma, inflammation of mucous membranes, Katrina cough, and Alveolitis. Climate change has also been attributed to more extreme weather events such as heavy rain falls which can lead to flooding. Increased carbon dioxide levels, hotter temperatures, and a longer growing season (each of which can at least partially be attributed to climate change) is causing poison ivy plants to be more potent. Other allergenic plants have also seen increases in potency as well as an expanded range because conditions attributed to climate change. Yogesh Shah – Associate Dean of Global Health at Des Moines University – discussed how has climate change has effected disease-carrying insect populations. “This is the most deadly animal around,” Shah said of mosquitoes, adding that the disease-carrying insects have killed more humans than all other animals combined. Approximately 600,000 deaths occur each year because of mosquitoes and reported cases of malaria are the greatest they’ve been since 1971. A relatively unheard of disease known as Chikungunya is on the rise, particularly in areas of Africa, India, China, and other parts of southeast Asia. Around 750,000 cases of Chikungunya have been reported in Caribbean and some cases have moved as far north into Florida and other parts of the U.S.
Two cases of Chikungunya has been reported in Iowa by people who contracted the disease while traveling. West Nile Virus is also carried by mosquitoes and in 2002 there were cases of either human or non-human WNV reported in every county in Iowa. Warmer temperatures and a longer growing season have also led to greater numbers of longer-living mosquitoes. Peter Thorne concluded the morning session by discussing mental health affects caused by increased heat and particularly warmer nighttime temperatures. The group then broke for lunch and spent the rest of the afternoon participating in a public health tracking portal presented by environmental epidemiologists Tim Wickam and Rob Walker from the Iowa Department of Public Health. 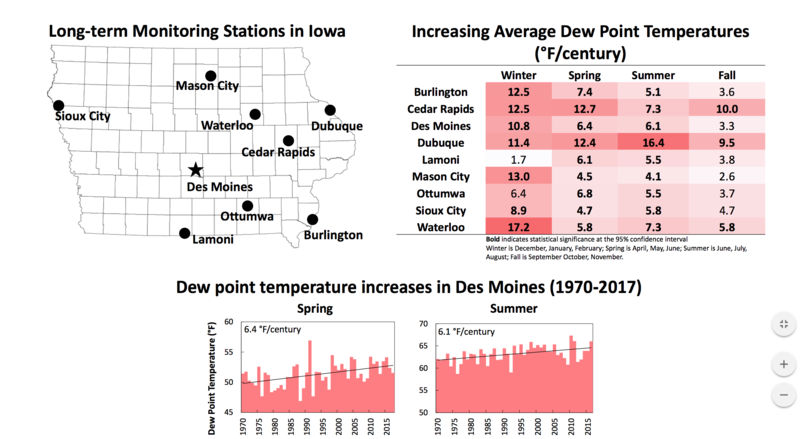 Many of the public health and environmental issues discussed at Iowa Climate Science Educators Forum were included in the Iowa Climate Statement 2014: Impacts on the Health of Iowans.